Need to grade a comic book? look no further, below is a quick rough guide to scale and grade your collection. The following comics grading scale is commonly used to rate the condition of comics. It includes the name of the condition, the symbol for the condition, and a numerical value. Mint (MT) Comics, 9.9 to 10.0: The best example of comic book condition ever seen. Perfect, or as near to perfect as possible. Near Mint/Mint (NM/M) Comics, 9.8: Almost perfect. Only minor imperfections. Comic book is flat and shows no wear. Near Mint (NM) Comics, 9.2 to 9.7: Nearly perfect with only minor binding errors allowed. Ink is bright and reflective, no cover wear. Very Fine/Near Mint (VF/NM) Comics, 9.0: Outstanding condition. Slight cover bend apparent and wear is almost imperceptible. Very Fine (VF) Comics, 7.5 to 8.5: Excellent condition. Relatively flat cover with minor corner wear. Paper is supple, not brittle. Fine/Very Fine (FN/VF) Comics, 7.0: Above-average condition. Minor cover wear shows. Corners may be blunted. Fine (FN) Comics, 5.5 to 6.5: Above average. Cover shows wear, but is clean with no creasing. Blunted corners common. Minor or moderate spine roll. Very Good/Fine (VG/FN) Comics, 5.0: Above average, but obviously used. Minor cover wear with minor or moderate creases. Minor staple tear and minor rust acceptable. Good/Very Good (GD/VG) Comics, 3.0: Used with substantial wear. Cover loose, or detached at one staple. Discoloration or fading apparent. Good (GD) Comics, 1.8 to 2.5: Substantial wear, obviously read. Dull cover. Moderate soiling and staining. Fair/Good (FR/GD) Comics, 1.5: Substantial and heavy wear. Cover lacks luster. Soiled, scuffed, and possibly unattractive. Fair (FR), 1.0 Comics: Heavy wear. Lowest collectible grade. Spine split and roll common. Missing, rusted, or discolored staples. 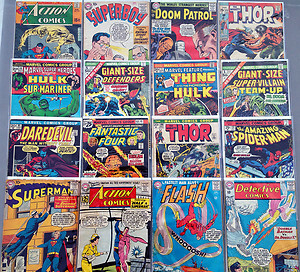 Poor (PR) Comics, 0.5: Little or no collector value. Missing large chunks. Corners significantly round or missing altogether.